Why do people really go to Naples? Through the grapevine I heard that Naples or “Napoli” was a very interesting city. Not to be judgmental, but it is known as one of the dirtier and more dangerous cities in Italy. I wanted to go there for one reason, and one reason only. Pizza. You haven’t had pizza until you have ordered the extra cheese margherita pizza from L’Antica Pizzeria Da Michele. When you enter the restaurant, they sit you down and you order. 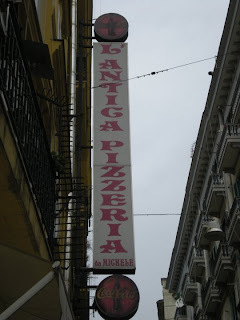 They have a limited menu, “margherita, margherita with extra cheese, coke, fanta, and nastro azzuro.” We all ordered cokes and the extra cheese margherita pizza. When the pizza arrived at our table we were all in shock. It was exactly how Elizabeth Gilbert described it, this melty mess of cheese and dough, that oozed everywhere with each bite you took. Suffice it to say, I was in heaven for the next 20 minutes and the table was completely quiet. 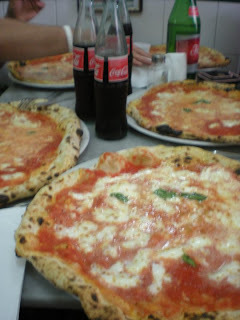 If you are going to Rome, it is literally worth it to take the train to Naples just to have this pizza, you won’t regret it! Pints of Guinness greeted us in Galway. 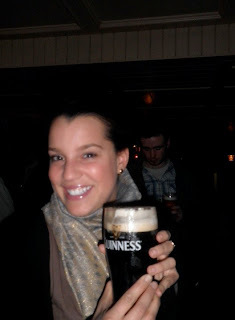 Though I had never had Guinness before, I was open to trying this thick, dark beer (it was the Irish thing to do!). Everyone kept saying, “Guinness is better in Ireland!” So I decided to have a pint, which led to another pint..then another pint..then another..and another. By the end of the fourth pint I was so full that I couldn’t possibly have another. Suffice it to say, I have found a new love for Guinness. 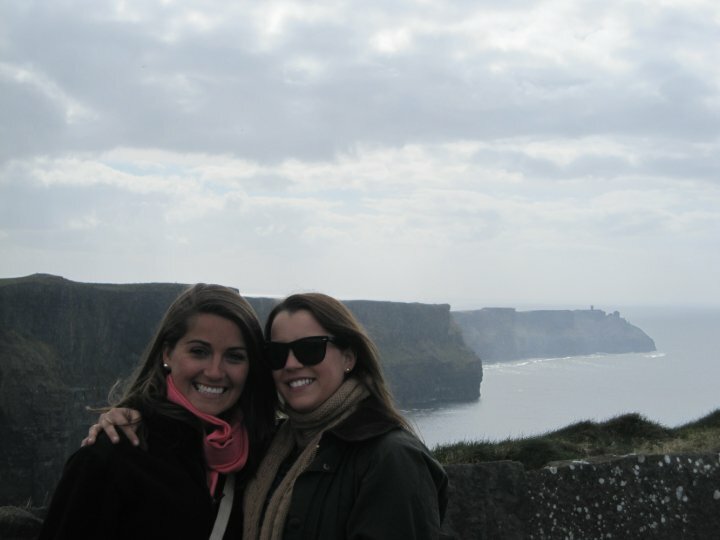 In the morning, Lindsay and I woke up early and headed to the Cliffs of Moher. Not having any idea what to expect, I was in for the shock of my life. 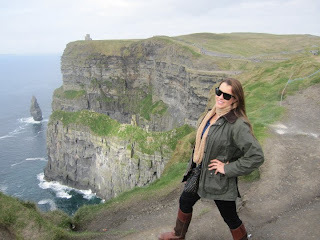 I could truly not believe my eyes when I peered over the edge of the winding coast that formed the Cliffs. They are without doubt the coolest natural sight I have ever seen in my life. Pictures could not do it justice, you just have to go there, trust me. We spent the rest of our time in Galway by wandering the cute little town, and it is there that I stumbled upon the original claddagh ring shop. When I was little, my dad bought me a claddagh ring that I loved dearly. One day when I was playing in my backyard, the ring slipped of my finger and was lost forever. I never got another ring, but when I saw the original shop, Thomas Dillions, I had to have one. I walked in and the old couple that owned the shop spent nearly one hour finding me a little gold claddaugh ring that would fit my finger perfectly. 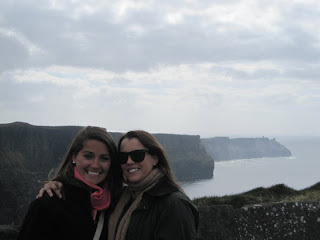 Before we headed back to Italia, Lindsay and I wanted to spend the day in Dublin, in particular visiting Trinity College, Old Temple Bar, and of course, the Guinness Factory. Dublin was a really fun city, and I wish I had gotten to spend more time there. 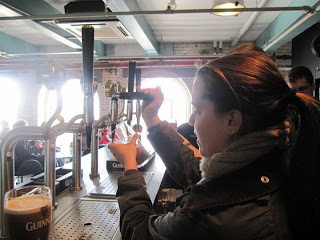 However, within the few hours that I was there I can officially say that I am a certified Guinness bear pourer, which is quite a miraculous feat if you ask me. 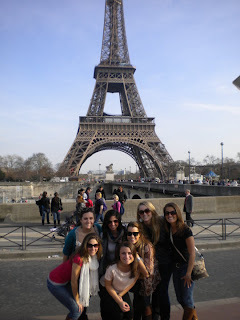 I am not quite sure when my obsession with Paris began, but my Aunt Lorraine doesn’t call me a Francophile for nothing. If you ever saw my bedroom, you would understand that I am living under the false pretenses that I am Marie Antionette—the woman is my idol. So naturally, I was thrilled for this leg of my spring break. After having extensively traveled Paris before, (an Arlene Farrell vacation in which every minute was planned and not one museum or sight missed) it was nice to just be there without the added pressure of running around trying to see everything in 3 days. The first day we were there, I met up with my roommate from BC, Mary Elaine, who took us on a walk all the way from the Louvre, down the Champs Elysees to the Arc de Triomphe. Though this was a long walk, it was nice to catch up with M.E. and plan the rest of our afternoon. M.E., knowing I have both a sweet tooth and a weakness for chocolate and coffee, decided to take me to a place she discovered that specialized in both. We sat at a small table in the back of the Foucher, and chatted as we sipped our cappuccinos and inhaled the most incredible chocolate I have ever tasted. That night, we all met for drinks at a bar called The Frog & Princess. Drinking pint after pint, it was fun hanging out with my roommates M.E. and Ariane. I crawled back to our hostel in the wee hours of the morning, only to catch a quick snooze before heading the most amazing place on earth. I dragged my friend Jack out of bed bright and early and told him that we were going to Versailles. With surprisingly little fight from him, we were on the train by 9 am. The man at the front desk of our hostel told us that there were two stops that read “Versailles” and that we should get off at the second one. Still exhausted and dare I say hungover from the night before, we obviously got off at the first stop, and realized we were stranded in the outskirts of Paris. Luckily, we ran into a young Parisian who told us how to get there. 5 minutes goes by then 10. Jack and I both look at each other and wonder where on earth this guy was taking us. Then we saw the large black and gold gilded gates; we made it. First, we toured the main residence. 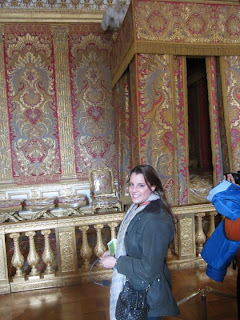 I had two favorite rooms: the hall of mirrors and the chapel. Both were not to be believed in person. 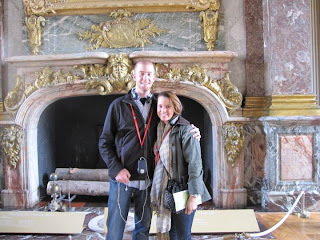 Though the palace was so crowded with tourists, Jack and I had so much fun wandering the many rooms of Versailles.of my Italian visa, and he lets me go in for free (Versailles became even that much better at this point). Jack and I got the tickets that would allow you to go anywhere of the property, including Marie Antionette’s estate. Next, we decided to go to the summer residence and Marie Antoinette’s estate. Now, this is a serious walk (which we were not aware of) however Jack was such a good sport. He knew that I was dying to see Marie Antoinette’s palace, so he didn’t complain once. He actually told me that we would stay as long as I needed to in each room..what a great friend! Marie Antoinette’s room was white floral, and she had a little sleigh bed. It was so calm and serene, and was a break from the elaborate styling and exquisite taste of King Louis. More than that, it was so fun to see where Marie Antoinette spent most of her time, reading and taking care of her children. When we got back to Paris, we went to the top of the Eiffel Tower, and overlooked all of Paris. I couldn’t help but remember my first trip to the top on our family vacation. It was so cold, windy and rainy, and I convinced my parents and Meghan that it was a good idea to go to the top. Meghan was shaking, Mom was wet, and Dad was cold. I was the only one with a huge smile on my face. Needless to say, it wasn’t the best of times, however looking back on it I laughed out loud. The most rewarding part of that rainy trip to the top of the Eiffel Tower was the Prada shoes that were promised to Meghan when we got to the bottom—naturally I received a pair too, thanks Dad! 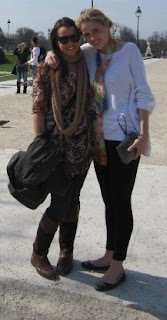 For my last day in Paris, I decided to meet Ariane for a day of shopping. First, however, she had to take me to her favorite place to eat in Paris. On the small nondescript rue des Rosiers, stands the restaurant L’as du Fallafel. The falafel was the best I had ever had and I highly recommend it. With both a passion for fashion and falafel, this was an unbeatable combination for a successful and amazing day. Then we said our goodbyes for it was au revoir Paris, and hello Ireland. The land where Pilsners come by the pint, goulash is the meal of choice, and crowns are the currency. 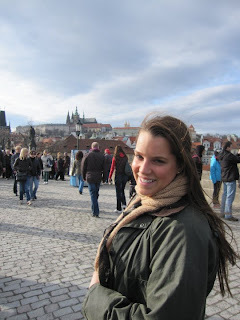 When I decided to go abroad, the one place I desired to travel to more than any other place was Prague. It wasn’t looking like I was going to make it there until my roommate Anastasia decided that it would be a great way to start our spring break. When we arrived in Prague, we were greeted by our friends Lucy and Maria who whisked us off to an opera at the National Museum. Having become a fan of opera after spending this semester studying it, I was excited to show off my knowledge. It was a compilation of what I used to call “dinnertime music.” The sound of Mozart’s Four Seasons and other famous works that our family used to listen to every night at dinner flooded our ears, and left us speechless. 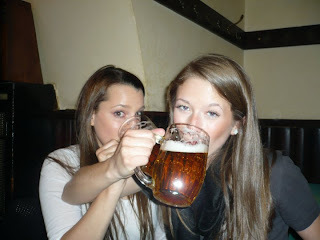 After the opera, we met our other friends Emily and Katie for a traditional Czech meal accompanied of course by Pilsner. After dinner we decided to call it an early night as we wanted to make the most out of the next day. We woke up early and went to the designated meeting place. A beacon of light—STARBUCKS. I was overwhelmed with joy as I sipped my grande non-fat iced latte, a novelty after having been in Italy the past couple of months, where a large coffee doesn’t exist, and putting skim milk in coffee has yet to be discovered. 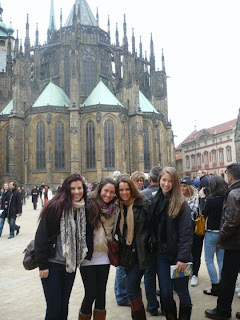 It is remarkable how much sightseeing can drain four girls, and at around 2 pm, Emily pulled out a list of restaurants. One word: Mexican. We hurried to this amazing Mexican restaurant where we ordered several plates of nachos, and had delicious fajitas. It was heavenly.We literally manhandled Prague, visiting the Old Prague Castle, Wenceslas Square and the Astronomical Clock, as well as walking across the Charles Bridge, You name it, and we did it. The most amazing part about Prague is its rich architectural history. It is a city that has yet to be bombed, so there are buildings from almost every century that are in amazing condition. We spent the rest of the afternoon wandering the streets in Prague, purchasing things such as homemade Czech lotion made out of wine and beer (weird but actually quite moisturizing), and, of course, eating. 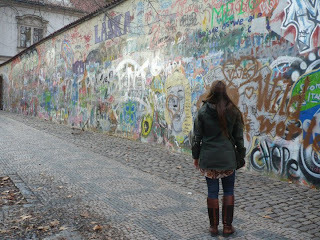 Some girls left to go back to Italia, and the others continued their spring break traveling Eastern Europe. I, however, had the pleasure of staying one more night in Prague, and did so in style thanks to Mom and Dad. They got me a room at the Intercontinental, where I spent the night in luxury. Then, it was off to Paris. On Wednesday night I decided to be spontaneous and book a flight to London for the following morning. Carpe diem, right? For those of you who do not know, I am one of the worst travelers, besides of course my dad. Nothing ever seems to go smoothly. So, in typical Farrell fashion, I arrive to the airport where I was informed that my flight reservation was never confirmed, and they had no record of my booking. I was determined to get to London, so I told Lufthansa airlines that I was getting on the next flight. They said fine and I was off. 45 minutes until closing. 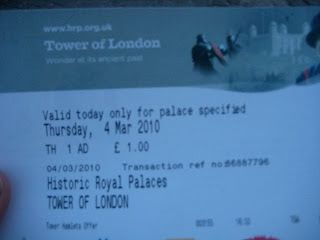 To get into the Tower of London you must pay 18£, and the guy in the ticket booth (approximately our age) said it wasn’t worth it. Tina read the sign on the window, where she discovered that it was only 5£ for children under 5 to get in. She then smiled and asked, “Is there anyway we could be 5 years old for the next 45 minutes?” With that he said “Do you have 2£?” And the next thing we know we are perusing the crown jewels for the bargain price of 1£ each. We documented for the nonbelievers. After the Tower of London, we went back to see Alex and Liz (my roommates we were staying with). We cooked dinner, and then went out to this amazing club. We didn’t stay out too late—for Tina and I wanted to tackle the city tomorrow, and we did just that. We got up at 9 am and were ready to go. We started with Westminster Abbey, where we spent a majority of the morning. We then headed to the British Museum to see the Rosetta Stone, and Cleopatra. 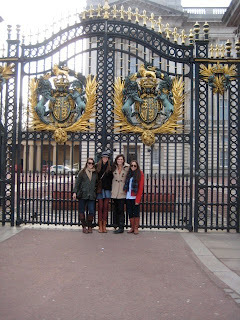 Afterwards, we met Alex and Liz, and ventured to Buckingham Palace. It wouldn’t be a trip to London without shopping, so we hit up Oxford Circus for some much needed retail therapy. That night, we went to a club called Proud, which is an old abandoned barn. It was very cool, and we were VIP. The next morning we went to Portobello Road. I was determined to find something special there, and I spent all day looking for the perfect little something. While we looking around one stand, I saw a ring out of the corner of my eye. It was in an itty-bitty heart-shaped box. I asked the woman if I could try it on. It was a garnet ring from 1950s, and was exactly what I had been looking for. It has had a new home on my left middle finger ever since. We decided to be touristy and head to Abbey Road, where we got a picture of us crossing the street. It was so touristy but such a fun thing to do. 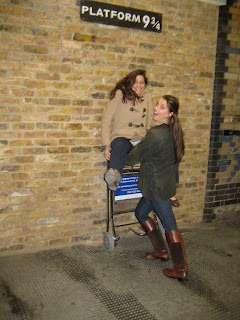 On the train home, we stopped at the infamous Platform 9 ¾ for all of you Harry Potter fans. We also made a pit-stop at Harrods. For dinner we went to a place called the Churchill Arms. You walk into a quaint little pub, that is authentic in all aspects except for one thing. As you make your way to the back, being pushed and prodded as it is so crowded, you discover a delicious Thai restaurant that has amazing pad thai. To my dismay, I had to leave early the next morning. I lost quite a few £'s, but gained wonderful memories in return. in high school, I spent several weeks in espana, going to school in Malaga, and traveling extensively through Toledo, Sevilla, Granada, Madrid, and several other cities. The one place I did not have the opportunity to visit was Barcelona. so of course I jumped at the opportunity to spend the weekend with my BC friends in Barcelona for my friend alex’s 21st. this past weekend I literally slept a total of 8 hours, even if that. But who needs sleep when your in Barcelona? On Friday, I headed to the airport where I learned that France was holding an airline strike. Knowing that ariane (my roommate studying in Paris) was already safe and sound in Barcelona, I did not think that this would be an issue. However, within minutes I learned that my flight was delayed, and alex and liz (studying in London) would not be able to make it for the weekend due to their flight being cancelled. A snowstorm in the US made getting to Barcelona questionable for friends tina, tripp, taylor, and kirk, but we were all just hoping to make it there. Luckily my plane got out of Roma, and I landed in Barcelona at 9 pm. I was greeted by ariane at the amazing hotel, Le Meridian (where we were supposed to be spending the night in a lap of luxury for alex’s 21st). Ariane told me to get dressed and we were out the door within the hour. We headed to pmac’s (another friend who was studying for the semester in Barcelona) where we met several other BC students and went right out to see dj crookers in a club/discotecca that seemed to have infinite rooms and floors . The party went on all night, and ariane and I retired to our lovely hotel circa 6 am. Being the little explorer I am, I dragged miss ariane out of bed at 9 am to do some much needed sightseeing. We headed to la sagrada familia, and many of gaudi’s buildings. 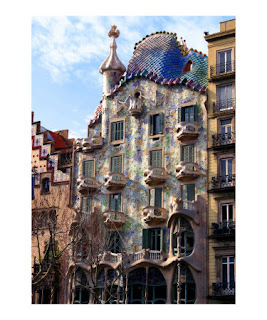 My favorite was by far the casa batllo. With no time to rest, we decided to go to the Barcelona vs. Malaga soccer game. We scalped tickets and landed 2nd row seats where we could see the sweat dripping from the players. We yelled "Barca!" at the top of our lungs, and had quite the experience. Riding home on the metro, we noticed a questionable character, and before she knew it, ariane had been pick-pocketed. We all felt terrible, but ariane did not let it get her down, and we immediately headed right out to the clubs on the beach. We danced all night long, and had a great time (except taylor was also unfortunate in the fact that his camera was mysteriously taken from his pocket). We again strolled into the hotel at 6 am, and caught some zzz’s before I had to catch a plane home to roma. All in all, it was a disastrously amazing weekend..one that left us broke, but with some great memories. Mi dispiace for not having blogged earlier, but I have been extremely busy traveling the last couple of weeks. 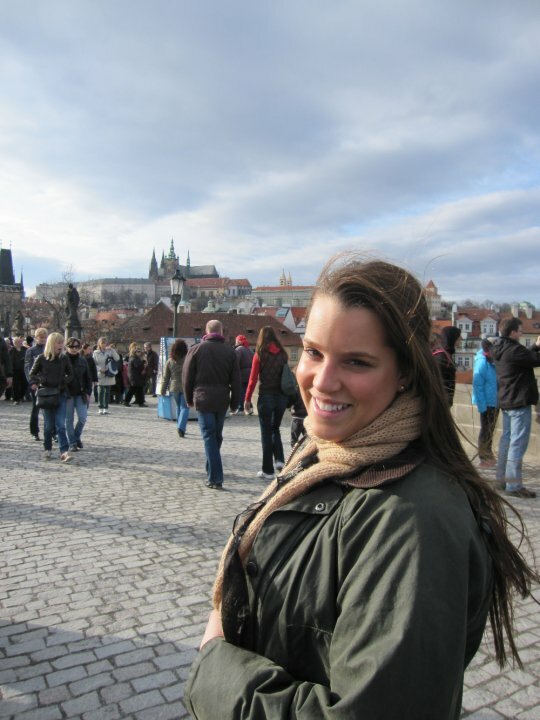 I had planned a trip to amsterdam with my friends from BC alex and liz and was so excited to see them. It is one of my dad’s favorite cities, and I knew that I would love it. Due to never-ending technical difficulties with my little friend blackberry, I lost communication with alex and liz, and the last I heard from them was to meet them at the “haaggen-dazs” in rembrandt square. This posed several problems, for I had no idea where rembrandt square was and had no way of getting in contact with the girls. When we woke up in the morning, we were completely famished and decided to grab something to eat. We stumbled upon a place called “B & B Lunchroom” and decided to go in. The sandwich selection was not to be believed—my choice was chicken, lettuce, tomato, mozzarella, pine nuts, and pesto. They had every possible type of muffin imaginable: lemon, apple, banana, cream cheese, chocolate chip, and many many more. Liz and I also decided to split the tomato soup, which came in this gorgeous giant bowl. We dove right in and were in awe as the fresh mozzarella hung from our spoons as we fought over who would have the next bite. The day was spent walking the streets of amsterdam, going under and over bridges and in and out of stores. When you are there, it feels as though you have landed face first in a scene from the christmas carol. I honestly believed I was in a little christmas village, just like the one that lives under my christmas tree. It was the cutest “dam” city! We then toured Anne Frank’s house, which was heartbreaking. They preserved the walls exactly how she had them during her time in hiding, and you could feel her presence as you walked through the rooms that were her life for so many months. We also visited the Van Gogh museum, which you could spend hour after hour browsing an impressive collection of his work. However, the trip wasn’t so innocent. After having heard so much hype about the red light district, I was determined to see this place for myself. As you casually walk through this little christmas city, you turn the corner and are suddenly in an entirely different world. I could not believe my eyes, as red lights flashed on and off, and people flooded the streets. I was sad to leave, but knew that more adventures were in store, as I was heading to barcelona the next weekend for alex’s 21st birthday!